There is one shadow in Pakistan that is getting longer whenever President Pervez Musharraf is looking at it. It is the ghost of 82-year-old Baluchistan leader, Nawab Akbar Khan Bugti, who was recently killed by Pakistan army commandoes. His assassination raised a banner of revolt in Baluchistan uniting warring tribal leaders against Musharraf. This is not good news as elections in Pakistan are scheduled next year. It also united the opposition who attacked the military regime for the killing of a leader who was highly respected in the region. By killing Bugti, the President only created a martyr that the southwestern region bordering Afghanistan and Iran badly wanted. His death led to an explosion of riots and protests leading to a surge in Baluchi nationalism warning Musharraf that he had just set the tinder box alight. For nearly five decades, people of Baluchistan had been demanding for more autonomy. Bugti was at the head of it all leading the Baluchi resistance movement. The Baluchistan area is rich in natural resources like gas and the people have been demanding a rightful share as more than 45 per cent of Pakistan's gas comes from its area. They were demanding royalty and development schemes to lift them off grinding poverty and backwardness. Bugti has become the face of the Baluchi movement. By killing him in the most brutal fashion using helicopter gunships and missiles, Musharraf has inadvertently hit the forward fast button for the movement. The irony is that Bugti was not anti-Pakistan. He was not demanding for secession. All he was asking for has more autonomy, better finances to service development and a respectable place for the province in Pakistan. Ironically, Bugti facilitated Baluchistan's entry into Pakistan as he was close to the founder, M. A. Jinnah who persuaded him to hold hands. As his death unites the grandsons of various aged tribal leaders including Bugti's, a new generation of leadership is going to emerge. They may be tougher than Bugti as they may not have his patience. Many tribal chiefs did not like Bugti because of his autocratic and despotic ways. The second irony is that the gruesome killing has united all of them in anger against the President. The Nation said that this was the first killing of a mainstream politician since Bhutto and The Daily Times called it the biggest blunder since Bhutto's execution. The Bugti killing has become a symbolic question of democracy versus military rule. Critics of Musharraf say that he will never be able to make peace with Baluchistan, as he will always think of a military solution as opposed to a political one. The opposition is now united in demanding a restoration of democracy through fair elections and of course, for the President to shed his uniform. As riots triggered off in various parts of Baluchistan, it underlined the anger against an oppressive regime. Tribal leaders in Quetta got together at a stadium and conducted funeral rights of Bugti though his body was not there, as it was not found after the cave he was living in collapsed due to the army onslaught. The anger at the funeral was too obvious to be missed. Baluchistan is the largest of Pakistan's four provinces. It is rugged and arid mountainous terrain in most of its 3,50,000 sq. km. It cannot be ignored as it accounts for 44 per cent of Pakistan. Opposition leaders demanded that the military onslaught be stopped and a political solution worked out before things get out of hand. Musharraf earlier had got a list of more than a dozen steps to be taken in Baluchistan to neutralize the movement, but nothing was ever done. Bugti's killing is rekindling anti-Pak sentiment not only in Baluchistan, but also in Sind. B. Raman, security expert and South Asian analyst, feels that the freedom struggle in Baluchistan has entered a new phase after Bugti's killing and Pakistan does not seem to have learnt any lessons of why Bangladesh happened. Natural gas was discovered in Baluchistan in the early fifties. Pakistan got it piped to far away areas like Sind but did not ensure that it reached the locals. Though it was the insurance to energy security of Pakistan, it ended up being the country's least developed province! It also got the least amount of funds from Islamabad and was not represented in the army or the bureaucracy. It was as if it did not exist. This was what had hurt the Baluchi people. The Sui natural gas field in the Bugti tribal area produces about 45 per cent of Pakistan's natural gas. The area is also rich in uranium and copper. But despite its rich resources, almost 45 per cent of the people in Baluchistan live under the poverty line, making it one of the poorest provinces in Pakistan. Even when Musharraf announced more investment in the Gwadar port of the province, locals saw it as a move to only bring in non-Baluchi into the area. Musharraf was planning to build a new energy corridor from Gwadar to China. It was his larger strategy to pitchfork Pakistan into anchoring its geo-political importance for China and Central Asia. With trouble brewing in Baluchistan, China's hopes of Gwadar being crucial to its interests, might just not work out. Already, Baluchi leaders are saying that they will not allow Gwadar's plans of development just because Musharraf wants it. 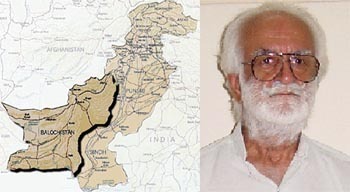 Bugti who was earlier the Governor of Baluchistan, was known to be a bitter critic of Islamabad's discriminatory policies. Just two months ago, Musharraf had labeled Bugti as a blackmailer who kept his own people under subjugation of a very cruel kind. Opposition leader, Mian Raza Rabbani, said that the government must immediately start negotiating on gas royalty and pay arrears immediately. There was wisdom in what he said as many felt that Musharraf had blundered with his trigger-happy ways. The sudden spurt of anger against Bugti was reportedly triggered off when a helicopter in which the President was flying was shot at when it was over Baluchistan. A red-faced President then ordered an attack by one of his elite army units. The writ of the government does not run in these tribal pockets for many years now. Rugged and gun toting tribals rule the roost. Since independence in 1947, Pakistan has not been able to make peace with Baluchistan. The tribals resented interference right from the start and wanted to keep their culture and aspirations intact. They loved the free nomadic life and did not want it to be disrupted by any federal rule. In 1973, there was an uprising that went on for four long years but the Pakistan government finally put it down brutally using helicopter gun ships. Thousands of people died. The lull is now over with the killing of Bugti. Musharraf is realizing that Bugti's death has become a dangerous political hot potato. Former military intelligence chief, Asad Durrani, said so in as many words when he signaled that Bugti dead was more dangerous than Bugti alive. Analysts say that his death is a blessing in disguise for the Baluchi movement against Islamabad. New leaders like Baluchi sardars, Attaullah Mengal and Khazir Baksh Marri may now emerge from behind the shadow of Bugti's death. Initially, Musharraf could not hide his glee while congratulating his army for bombing the cave of Bugti and killing him But as flames of protest spread, the army hastily said that they had nothing to do with the killing and they had just gone there to negotiate with the tribal chief and there was an explosion from within which lead to the cave caving in and killing him. Clearly, it was a blunder that is going to take long for the President to recover from. Musharraf will now realize that religion cannot be a basis for unity or even nationalism for that matter. He should have learnt it when Bangladesh happened. After all, it is regional aspirations, language, pride in one's unique culture and ethnicity that drives people to stick together. Baluchistan cannot be treated as a colony of Pakistan anymore. They will sooner or later demand a framework that can help them soar higher and meet the aspirations of the people. If the resentment continues, it could spin out of control. Baluchistan is not going to be an easy riddle for Musharraf in the times to come.